Since Pinterest does not include the recipe content itself, you will need to click through to the actual website that contains the recipe, and then you can use our browser to save the recipe. 1. When you find a recipe you like, press the "Read it" or "Make it" button to load the original site in their pop up browser. 2. In the resulting toolbar, press the Copy Link button. 3. Switch to Paprika. It will detect the link has been copied to the clipboard a prompt you to open the link in Paprika's browser. 4. 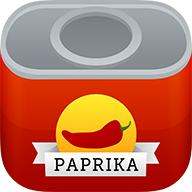 Use Paprika's browser to save the recipe as normal.